Hecker worked on numerous collections at the Ransom Center, including the papers of Norman Mailer and David Mamet. In the spring of 2009, the Harry Ransom Center received a grant from the National Endowment for the Humanities to catalog the Morris L. Ernst papers. The collection will be closed to researchers until the project is completed in the fall of 2011. During that time, a team of one full-time project archivist and two part-time assistant archivists will arrange, describe, and preserve the Ernst papers. They will also produce a standard finding aid (or guide to the collection), which will be available online. 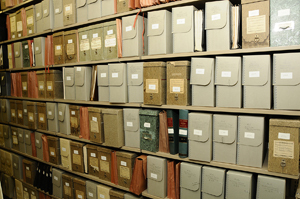 During the cataloging process, the archivists aim to achieve two goals: access and preservation. The Ernst papers, despite being uncataloged, have been used frequently since their acquisition. Several lists and indexes to the papers exist, but they are incomplete, unreliable, and difficult to navigate. This project will replace those various guides with a standardized, online finding aid, which will be searchable and generally much easier to access and use. The other goal is to make the physical material last as long as possible, so that the information contained in the papers will remain a part of the cultural record. To this end, project staff will re-house the papers in acid-free boxes and folders. At-risk items—those that have been damaged by water, age, or other environmental factors—will be treated by the Center’s Conservation Department. The Ransom Center has a state-of-the-art lab where materials can be stabilized for long-term preservation. When the cataloging project is complete, the Ernst papers will be housed with the Center’s other collections in secure temperature- and humidity-controlled stacks, ensuring the papers’ availability to researchers.